Sometimes I feel like I'm the only one who remembers a time, about 5 or 10 years ago, when bringing morality into politics was the most horrible, Nazi, Handmaid's Tale thing you could do. Now they want the government to put up "guardrails" against immorality? Do people really not notice how quickly and completely the Left has flipped from "Get your laws off my body/out of my bedroom" to being the "everything is problematic" morality police? I know a lot of folks roll their eyes when I start ranting about propaganda but honestly this state of affairs didn’t happen accidentally. The manipulation of the masses was a learned skill back before modern electronic media. You think the understanding and tools are less powerful now? Occams razor applies. She was elected by a combination of Bernites and minorities. Literally elected by virtue of being a minority woman, with no nod to any accomplishments or credentials. Democrats win the shutdown battle with trump. Guess who the only Dem to vote against opening the government, and paying federal employees was....? Because ICE is her excuse. 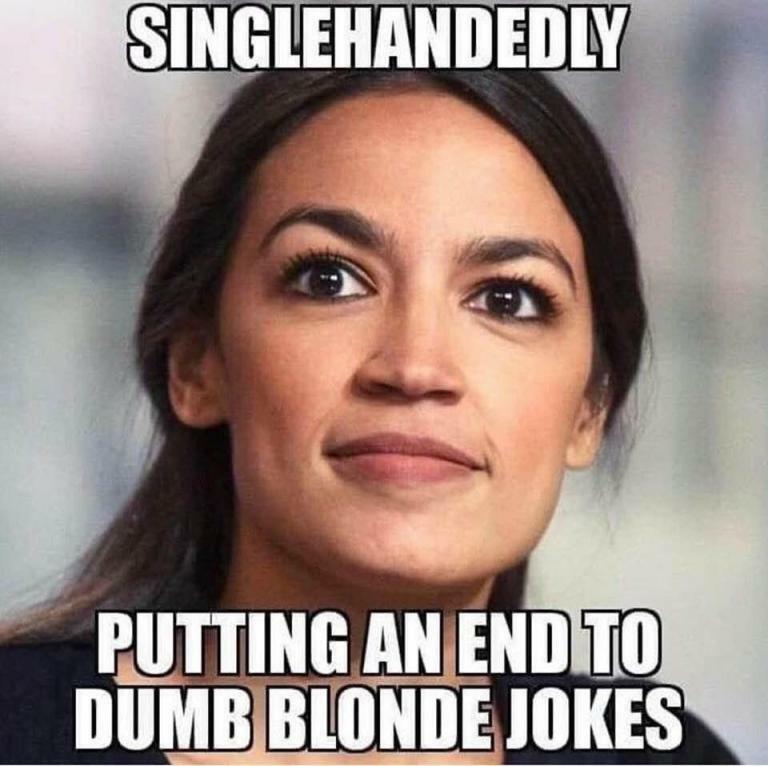 Been seeing AOC as the abbreviation for some time. In fact if you type AOC into google Alexandria Ocasio-Cortez comes up. Where are you seeing ODC? I was being sarcastic with the initials misspelled. Okay, thought maybe something was going there that I wasn't aware of. Old Dumb something that starts with C? Well, I wouldn't call her old (29) so maybe the O means Odorous? Lets not forget she's in congress because a grand total of 15,897 people voted for her in the primary and 110,318 in the main. No worse than being in your state senate because you were hand picked and elected in a completely one party area. She's president material! It's fine to make fun of some of the dumb stuff she does - I do that myself. However lets keep away from foul language descriptions, including allusions to the descriptors. Thanks. Ok, I understand and promise to "play nice." I was absolutely not implying anything of the sort and lets keep this on track. I was making fun of the media abbreviating her down to her initials. Like she's Cher or Prince or some *expletive deleted*it. Oh, she's definitely "some *expletive deleted*it". Media criticized by the right: "You filthy nazi bastards that hate the heroes of journalism!" Media criticized by AOC: "We deserve it and please may we have some more?" She was asked about Roe vs Wade, and said she would prefer row across the Rio Grande because she doesn't want to get her shoes wet by wading. Wrong ethnicity, and she was born here, anyway. I don't believe one can wade from Puerto Rico to the U.S. Since Puerto Rico is part of the United States she could just take a Uber.